This small group kayaking trip uses our brand new, custom-built catamaran to go where the paddling looks best for the day and where the crowds aren't — either Northwestern Fjords or Holgate Arm. This is an adventurous trip. It is very fun, but it operates outdoors, so you should be prepared to paddle in all types of weather. in a kayak, and with riding in a water taxi for several hours on open seas. 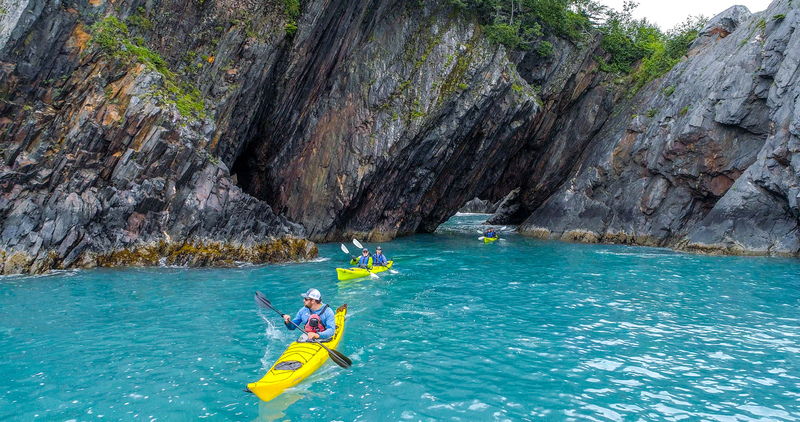 Another summer season is around the bend, and with it Liquid Adventures is proud to offer another first for clients who want to explore Kenai Fjords National Park by kayak. For the same price as other companies' pre-planned trips to Aialik, kayakers who book our private boat trip will not be sharing the water taxi with any other company, allowing our groups the flexibility to choose the remote glacial landscape that we paddle in for the day. What's the big deal about having a private water taxi? Simple — your boat captain and guide can decide which destination in the Park is best for each day's paddle. They determine the destination based on weather, crowds, and wildlife. This means you will always be in a small group, on a boat with intimate interaction with your captain and guide, and away from the crowds. 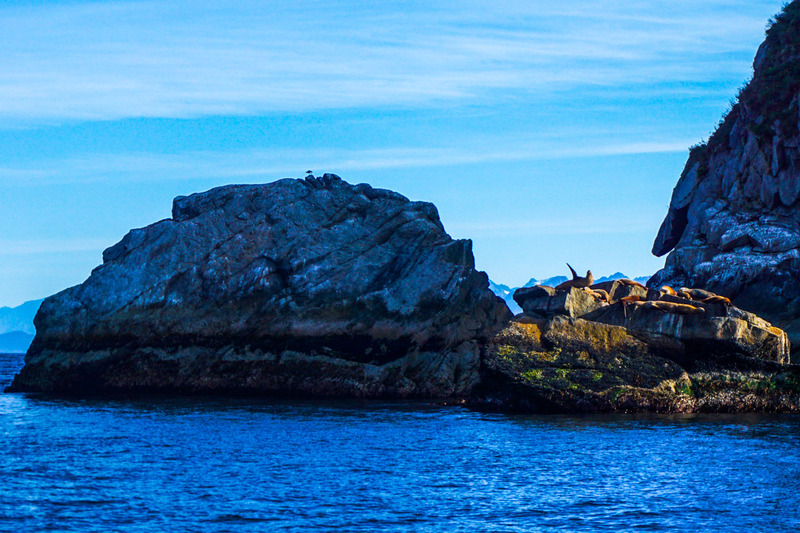 On your trip, our guides and captain will assess the day and navigate through the small passages, nooks and crannies of the rocky fjord land coastline to find whales, sea lion haul outs, hidden coves and the best kayaking spots. 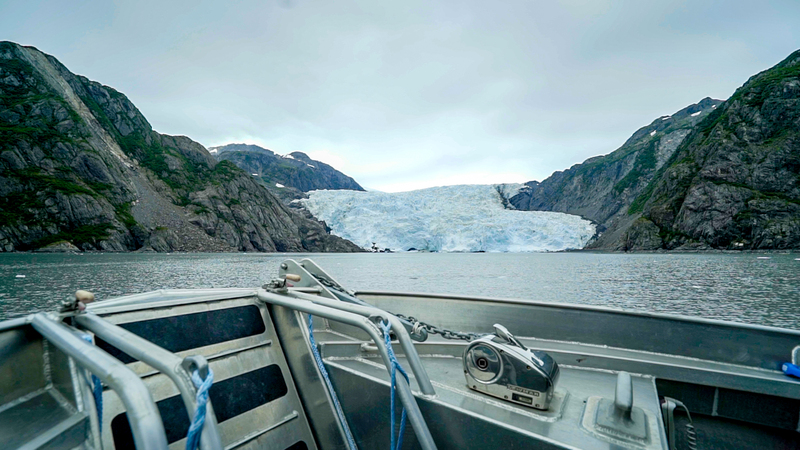 Most days we will be exploring the multiple calving glaciers and steep granite cliffs of the remote, and beautifully raw Northwestern Fjords, or the waters of Holgate Arm with its massive tidewater glacier, ample coastal waterfalls and frequent visits by humpback whales. You will have the feeling that you are an integral part of making the trip complete, as there are no set destinations or itineraries — only what's best for the day and the group. 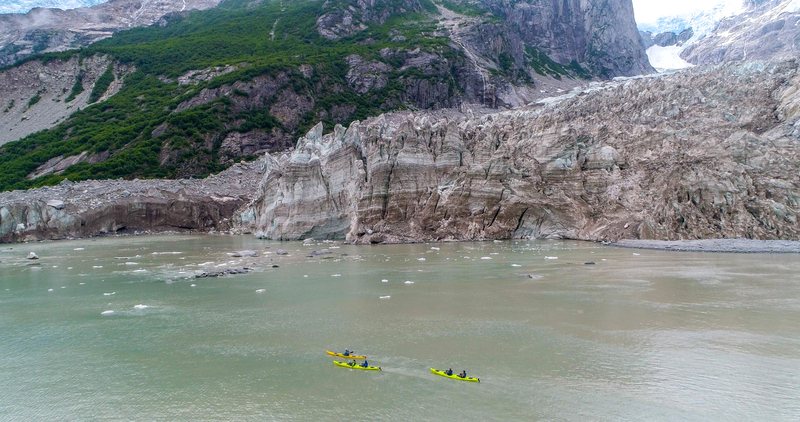 Because Liquid Adventures runs this boat, there are no other kayaking companies to coordinate with, and that means that we can avoid the 40-50 paddlers that often descend upon Aialik glacier on other kayaking trips. On the morning of your trip, after meeting at our office and getting geared up, we will head to the dock and board our private water taxi. 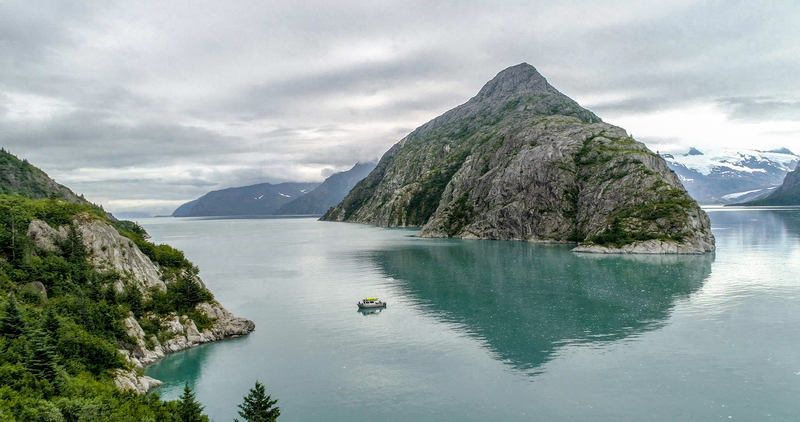 The 2-3 hour cruise to the Fjords will be spent whale watching, spotting otters and sea lions, searching for puffins and sometimes even catching a glimpse of black bears or mountain goats. Once at our kayaking destination, our boat will either land at a beach or directly launch our kayaks from the landing bow. 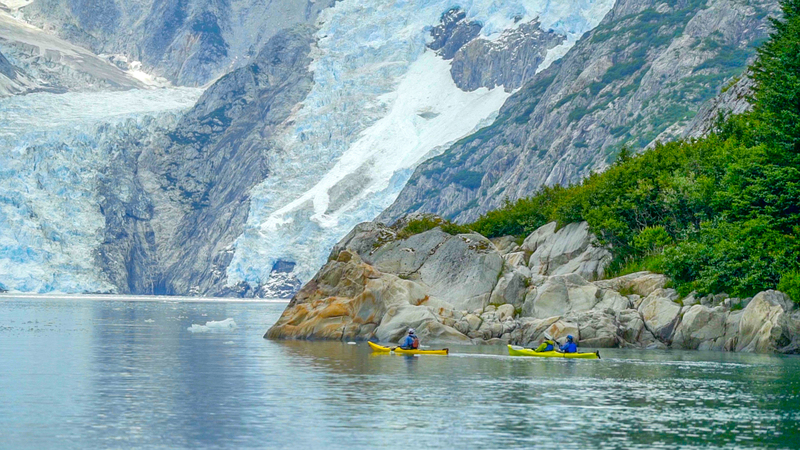 Our groups spend about 3 hours kayaking through an unimaginable world of towering cliffs, waterfalls, tidewater glaciers, floating chunks of ice, and wildlife in every direction. Our delicious homemade lunch is served either on a beach, in the kayaks, or on board our water taxi depending on the day and conditions. Expect more from your kayaking company. Liquid Adventures has been the proven leader in experience and quality for 15 years in Seward. Our guide retention rate over the last five years has been 100%. That speaks volumes to the vibe we have here at Liquid. Our guides are stoked everyday because they work in an environment that empowers them with professional decision making and route finding. No predestined routes here. Our guides have a minimum of 4 years experience before leading for us, and have a minimum ACA level 2 cert with most certified at level 3 or 4. These professionals love their job, and their job is to take you to one of the most exciting, active, awe inspiring natural environments in the world. 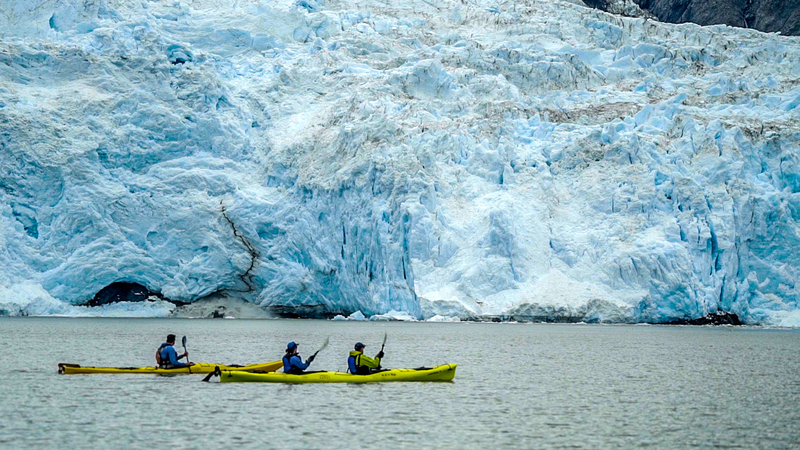 Consider this THE boutique kayaking adventure in Alaska; we think it is. And this season we are offering this trip for the same price as the large water-taxi, multi company tours to Aialik that other companies provide. Our tag line is "Where paddlers come to paddle", and we mean that, but without a crowd. This trip tends to fill up several weeks in advance, as we only take 6 clients at a time. Reserve your trip early! Actual start date changes every season, depending on environmental factor. ​Total trip time is 5.5 hrs from start to finish (approximately). Roughly 2.5 hours are spent paddling. While not especially physically challenging, this trip does require that you are comfortable standing on a Paddleboard. No Experience? Come out with us on a discounted Paddleboard lesson the day before and get your chops to where they need to be. Don't be late! The water taxi won't wait for us if you're running late. Paddling groups are never larger than 6 people. We'll never have more than 12 clients on the boat at any time. This trip is great for those who want to paddle with a small group. The area we paddle is well-protected, and the small group allows us to cater to the skill-level of our paddlers on any given day. We use sit-in kayaks for this trip. 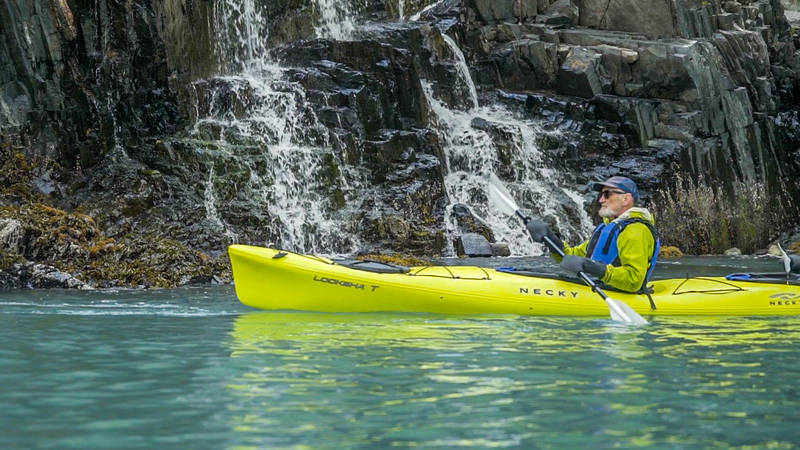 You can have your camera around your neck or in a dry bag — we do have water-tight compartments in all of our sit-in kayaks for you to store your gear, but it can be hard to access these compartments while on the water. It's important to bring waterproof and warm clothes to ensure that your experience is as pleasant as possible. Be sure to ask us for recommendations on specific clothing and gear. Good rain gear is a must. From our office, we'll take a 2 minute van ride to where the water taxi is moored. After boarding, it's roughly a 2 hour ride to Aialik, or a 2.5 - 3 hour ride out to Northwestern. We take our time on the way out, looking constantly for marine life like whales, otters, puffins, porpoises, and much more. The journey out can usually be considered a wildlife tour in and of itself. When we get to our destination, we unload the kayaks and cast off from the vessel, which will return and meet us at the end of the day. This is a private vessel used exclusively for our tours that is comfortable and fast, offering a more exclusive experience than some of the larger vessels in service. Ride in a small, well-appointed water taxi out to the Glacial Fjords. Please note that this ride, while usually calm, can sometimes get bumpy if weather comes in. We always do our best to make the ride comfortable, but we can't control the weather! A maximum of 12 clients are on the boat during a trip. The ride in the water taxi is roughly 2-3 hours in each direction. The exact time is highly dependant on weather, and wildlife sightings. Usually, one direction takes longer than the other because we're searching for whales. This is a video highlighting the areas that we paddle in on this trip. 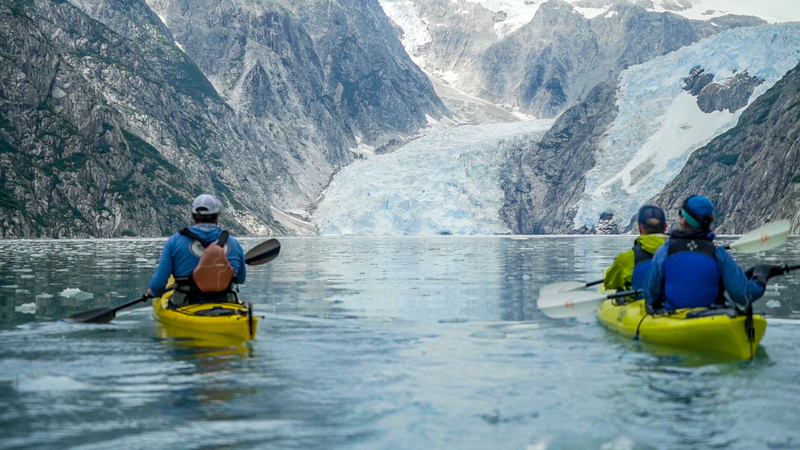 There's some pretty stunning shots of the Fjords in this video. Don't be afraid to turn up the volume on this one! Package a tour with our partners and save some serious cash! We've worked over the last several years to set up partnerships with locally owned adventure companies Exit Glacier Guides and Major Marine Tours. These companies are leaders in their fields, and we're proud to offer discounts on select trips. Congratulate yourself, and bask in the satisfaction of saving serious cash on your trip to Alaska!